The results are in for the fifth GLOSS 2014 race in Lloyd Park! SLOW take another great win with 578 points, again the highest of the series so far. It wasn’t enough though, as in fact HH had it wrapped up a week ago! Congratulation Happy Herts, the formidable triple wins at the start of the series sent tremors around the Orienteering world that no club could counter. A 4.5 point margin is massive in GLOSS scoring, so you deserve the fantastic prize of a small red tonka bus, well done!! SLOW’s good Lloyd Park performance didn’t quite allow them to jump above HAVOC into second place, both clubs providing more than enough runners to score good points, but HAVOC taking the runners up glory. A special mention to Anthony and Janet Biggs HAVOC, David Float HAVOC and Nikolay Kolev TVOC for being ever presents at all 5 events, great work guys! Three cheers for Happy Herts, Hip Hip Hurrah, Hip Hip Hurrah, Hip Hip Hurrah!!! The results are in for the fourth GLOSS 2014 race in Ham Lands! 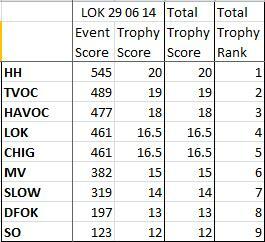 LOK planned well with their 6 attendees scoring well to take =2nd on the day with HAVOC. Remember only the top 6 from each club contribute to the result. 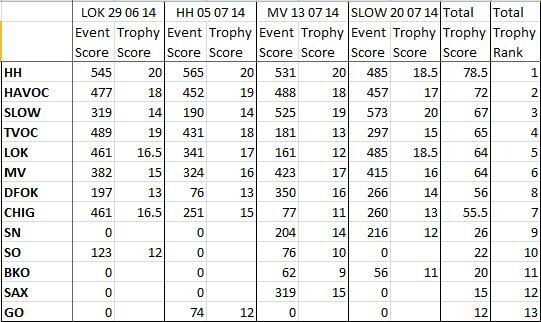 HH and HAVOC keep their 1 and 2 leaderboard slots with solid =2nd and 4th place finishes, well done guys. The results are in for the third GLOSS 2014 race in Nonsuch Park! Those Happy Herts are odds on for a trophy win after another great team effort, their top six runners all scoring in the top 25. HAVOC’s strong turnout allowed them to consolidate their second place in the chase for the golden Jules Rimet (small red bus) trophy. Likewise for MV and SLOW as they rose above LOK and CHIG into fourth and fifth respectively. The predicted re-emergence of more southern clubs has come about, if only I had been to Billie Hills…. The results are in for the second GLOSS 2014 race up in Whippendell Woods! 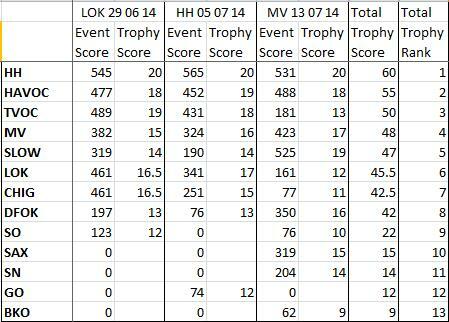 Happy Herts take victory again, with HAVOC moving above TVOC into second place being the only top 8 club movement. Will the newly upgraded Thameslink tempt the HH legions South to Nonsuch Park to consolidate their stranglehold on the coveted trophy? Or will they copy the black cabbies and refuse to cross over into the southern badlands, leaving room for the other clubs to close the gap? 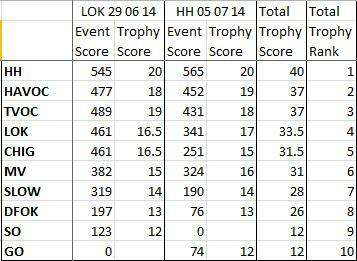 Results of LOKs Trent Park GLOSS on 29th June here, including GLOSS handicap times and positions.